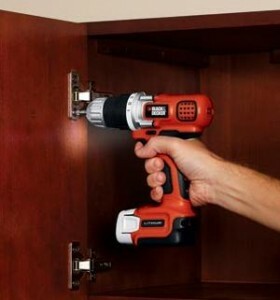 Comfortably small, lightweight and powerful with a long lasting charge, this variable speed drill has a 3/8″ chuck, illuminates the work area and gets high marks. 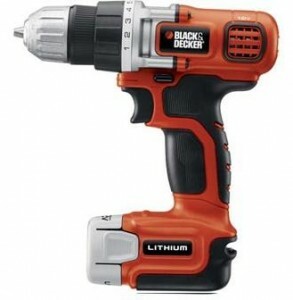 I’ve never been a Black and Decker fan so I was surprised and delighted when I bought this drill. I was assembling kitchen cabinets and needed to work in close quarters that had dark, tight spaces. My trusty Ryobi 14.4 V drill was just too big and it did not have an LED illuminating LED to see what I was drilling. My previous experience with rechargeable tools from B&D were that they lacked power and weren’t very durable. Still, I’m a guy who will buy a tool based on its duty cycle. For a homeowner who may do occasional drilling/screwing, there is no need to buy a $200 pro tool. So I went looking for a small rechargeable drill/driver for under $50. There weren’t many to choose from that illuminates the work area at the time that I was looking. So when I came across this little workhorse, I bought it thinking I could always return it if it turned out to be like my other B&D tools. Surprise! I loved it. B&D12V MAX Lithium Drill fits tight spaces. It has a somewhat soft grip giving you plenty of holding power. The LED work light goes on with the first pressure on the trigger without turning the motor. I liked that. However, the illuminated area was just below the actual screw or drill mark. It could be greatly improved if the LED actually shone on the tip of the blade or drill bit. The 11 position chuck torque settings keep you from damaging the most sensitive screw in that it stops them from stripping. When you’re drilling, you can set it to the “Drill” setting and the torque is constant. Providing a nice high speed hole cutting experience. The Lithium Ion Battery seems to last a very long time. I have no data on how many screws it will drive because it all depends on the size of the screw and the material your screwing it into. I’ve driven 4″ Decking screws fully in without even the smallest hitch. 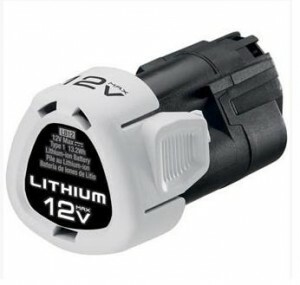 The only downside with lithium powered tools is that they usually have a low voltage discharge protection circuit. That means you get no warning when it will run out and stop. Dead, One trick is to wait a minute or so and squeeze the trigger and you might just finish that last screw before putting it on the charger. But not much else. It needs a charge. As far as I know from my research on batteries, there is no harm to fully discharging a lithium ion battery and you get a lot of drilling and screwing done before that happens. Charging is simple – the battery pulls right out and fits into the charger as you would expect. It’s pretty small compared to the older NiCd or NiMH battery packs. For a fully exhausted battery, I waited maybe 3 hours for it to fully charge. But you can put a lithium battery on it’s charger when it’s only partially depleted. That’s what makes lithium batteries great and it comes in handy if you want to start a project but don’t know how much juice is left. Once charged, the specs say it can hold a charge for more than a year! I’ve picked it up after not using it for 2 months and am always surprised by the freshness of the battery and the torque it gives. Did I say I love this drill? Cons: LED does not shine on the tip of the driver leaving the surrounding area brightly lit and the tip hidden in the dark. The contrast is enough to make you pull the drill back until the work area is lit then give it another go. Rating: I give this drill a 4.5 and not a 5.0 because of the light. If the light actually lit up the tip, I would give it a full 5 stars. It’s that much fun to use and gets the job done.